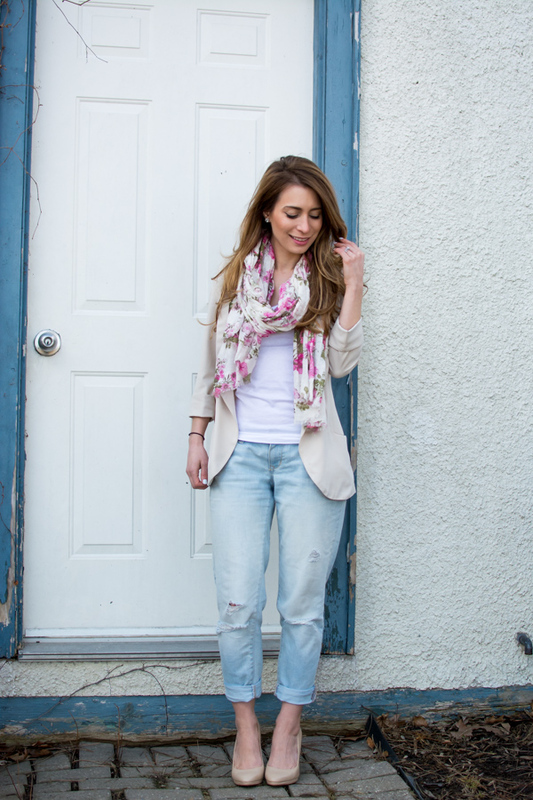 OOTD - Spring Florals + Neutrals | La Petite Noob | A Toronto-Based Fashion and Lifestyle Blog. Happy first weekend of Spring! Although it certainly looked like Spring outside this weekend, it definitely did not feel like it - why is it still so cold? Impatient for the warmer weather, I dressed the part of the season this weekend in light neutrals with a pop of floral. Although I nearly froze to death for these photos, I still stand by my outfit choice. Bring on the warmer weather of Spring, I'm ready for you! Read on for outfit details and additional photos. Although I've been swamped with the organizing and packing that goes along with moving this week, I have some exciting news for my 30 before 30 list - I'll be attending a fashion show at The World Mastercard Fashion Week in Toronto! I'm so excited to experience my first fashion show, and knock another task off of my list. Are you excited for Spring - even if you live in a climate that hasn't gotten the memo that it isn't still Winter? Let me know! Loving everything about this outfit. Such lovely colours! Also- I will be attending some shows too! Email me pacifico.gab[at]gmail.com if you would like to try and meet up. That's awesome! I'll just be at the Malorie Urbanovitch on Wed. Will you be there?? YES!! Can't wait to meet you! You look so gorgeous! Love the floral scarf and the casual Spring look! Thanks Alecia! I have no business wearing this, since it's been so cold here lately! I'm hoping that this outfit will entice the warmer weather to arrive - LOL! Yay for spring! I love your scarf and blazer combo! I know! I'm excited, and have no idea what I'm going to wear! Next time it comes around we'll go together!